Thread: Love is in the air? 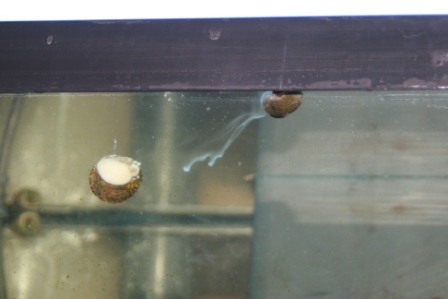 Is this snail doing what I think he's doing? A little premature ahahahahaha they haven't even touched ..
Hahaha! That is too funny Poor little snail got all excited! I was pretty shocked to say the least! He had absolutely no dignity! He may have been a bit far away but in looking at all the pics I took, boy does he have good aim!.. hahaha! lol, looks like an astraea and they are broadcast spawners. 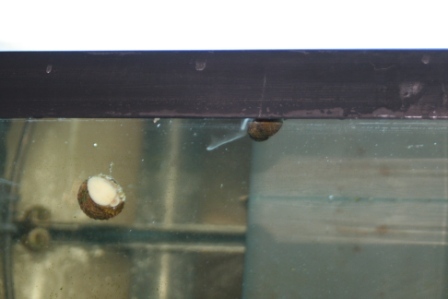 unlike egg layers they release gametes into the water column and hope the meet up. 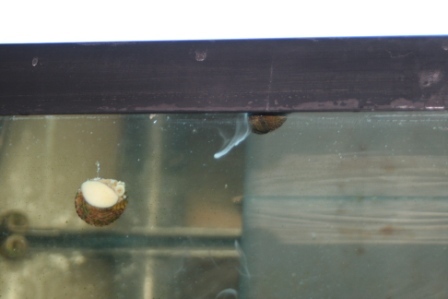 I've had margarita snails do the same thing. You must be doing something right if things are spawning. I've also got a nice zig-zaggy line of eggs on the glass..
u playing some Manilow again ?